A commercial cargo ship loaded with some 3,276 pounds of equipment and experiment samples, believed to include mice that were on board as part of a muscle atrophy study, returned to Earth Saturday to close out a five-week visit to the International Space Station. 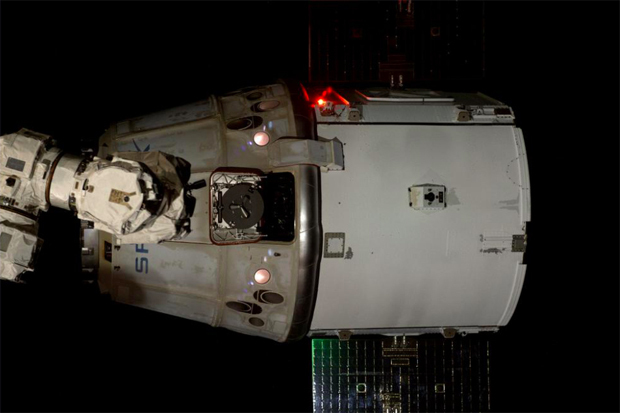 Astronaut Reid Wiseman, operating the station's robot arm, detached the solar-powered Dragon spacecraft from the forward Harmony module around 8 a.m. EDT (GMT-4), maneuvered it into position and released it to open space at 9:57 a.m.
SpaceX flight controllers at the company's Hawthorne, Calif., plant then uplinked commands to fire the spacecraft's braking rockets at 2:43 p.m., putting the capsule on course for a fiery plunge back into the atmosphere. The Dragon's re-entry systems apparently worked normally, parachutes deployed and the cargo ship splashed down in the Pacific Ocean 265 miles west of Baja California at 3:38 p.m.
Recovery crews standing by aboard a ship in the landing zone planned to haul the spacecraft back to Long Beach, Calif., where time-critical research samples will be offloaded and turned over to NASA. The capsule then will be shipped to SpaceX's McGregor, Texas, facility where the rest of the cargo, including computer gear, spacewalk equipment and other hardware, will be removed. This was SpaceX's fourth station resupply flight under a $1.6 billion contract with NASA that calls for 12 missions to deliver some 44,000 pounds of cargo to the International Space Station. The Dragon departure sets the stage for the undocking of a Russian Progress cargo ship from the Pirs module at 1:39 a.m. Monday. Unlike the Dragon capsule -- the only station resupply craft capable of carrying cargo back to Earth -- the Progress will burn up in the atmosphere later in the day. Orbital Sciences plans to follow the Progress and Dragon departures with launch of a commercial Cygnus cargo craft from Wallops Island, Va., on Monday at 6:45 p.m. Making the company's third operational resupply flight, the Cygnus is expected to be captured by the station's robot arm and berthed at the Harmony port just vacated by the Dragon spacecraft on Sunday, Nov. 2. The Russians, meanwhile, plan to launch the Progress M-25M/57P cargo craft at 3:09 a.m. Wednesday. Following normal practice, the Progress will execute an autonomous rendezvous with the station, docking at the Pirs module about six hours after launch. Amid all the cargo ship activity, three of the station's crew -- Soyuz TMA-13M commander Maxim Suraev, Wiseman and European Space Agency astronaut Alexander Gerst -- plan to return to Earth Nov. 10 to close out a 165-day stay in space. Expedition 42 commander Barry "Butch" Wilmore, Alexander Samokutyaev and Elena Serova will have the station to themselves until Nov. 24 (Nov. 23 U.S. time) when the Soyuz TMA-15M ferry craft brings Anton Shkaplerov, NASA flight engineer Terry Virts and ESA astronaut Samantha Cristoforetti to the laboratory.